[THIS COMPETITION IS NOW CLOSED] WIN tickets to Greenwich Music Time, one of London’s best music events! Fancy seeing Goldfrapp’s only London performance this year? Then you best get down to Greenwich Music Time, an event taking place over 4 days at the legendary Old Royal Naval College in London. It’s playing host to 4 fantastic acts, including Goldfrapp, Jools Holland, Russell Watson and the Royal Philharmonic Orchestra, and the Australian Pink Floyd Show. We’re also giving away 40 pairs of VIP tickets, which include one of the best seats in the house and full VIP hospitality at the concert. Excited? Here’s a bit more information on the acts for you to sink your teeth into. Tribute acts don’t come much bigger than the Australian Pink Floyd Show. Forget those dodgy blokes down the pub stumbling through ‘Comfortably Numb’, these guys are the real deal with a mind-blowing visual display and some quality renditions of classics from across Pink Floyd’s legendary album. They’re so good that Dave Gilmour, the actual Pink Floyd’s guitarist, booked them to play at his 50th birthday party! The legendary electropop duo takes to the Old Royal Naval College stage for their only London show of the year and it’s bound to be an unmissable performance. Goldfrapp will be performing hits from their back catalogue, from their iconic debut Felt Mountain right up to 2013’s critically acclaimed Tales of Us. Russell Watson needs no introduction. The tenor has sold over 8 million records worldwide and is one of the most recognisable voices in classical music. Supported by the Royal Philharmonic Orchestra, Russell will be performing songs new and old. There’ll be a couple of special guests too, including renowned stage actress and singer Kerry Ellis. The host of ‘Later…’ and the annual New Year’s Hootenanny, Jools is bringing his Rhythm and Blues Orchestra to Greenwich for one big homecoming party. Local lad Jools will also be bringing some guest vocalists along for the ride, including Spice Girl Mel C and Soft Cell’s Marc Almond. For more information about Greenwich Music Time, check out their website (where you’ll also find full ticket details). 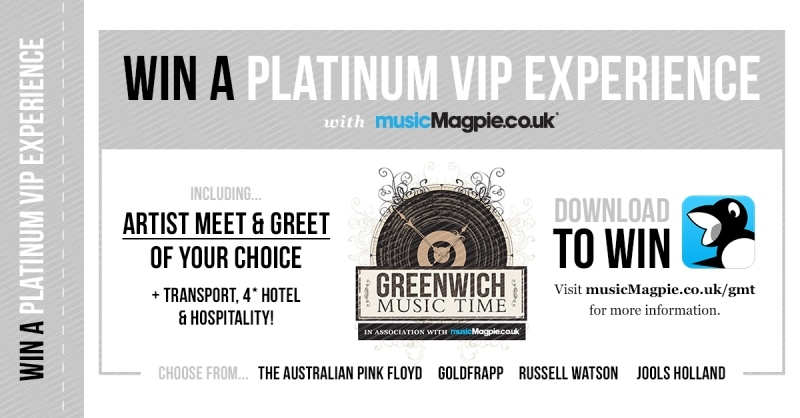 And click here for full information on how you can win tickets to GMT with musicMagpie. Good luck!